Making its trade fair début on the exhibition stand of Buss AG, Pratteln (Switzerland), at NPE 2012 in Orlando/USA (2th to 5th April 2012) will be this company’s four-flight Laboratory BUSS Kneader MX 30. The MX 30 completes the range of four flight MX compounding units. Featuring a flanged-on discharge screw, the laboratory BUSS kneader is rated for output rates of 5 to 25 kg/hour respectively for batch quantities upwards of 300 g. It has a maximum screw speed of 800 r.p.m. Visitors to the BUSS stand (Nr. 7463 in West Hall) will be able to view the kneader with its barrel housing in the opened position permitting a clear observation of the working of the four-flight co-kneader, namely the dual rotational and oscillating motion of the screw and its combined axial and transverse mixing action, which together ensure an extremely high quality of mix. • Halogen-free, flame-retardant (HFFR) cable compounds; during the compounding process, the temperature of the melt must be kept below 180 °C – at any higher temperature the flame retardant ATH (alumininum trihydrate; Al(OH)3), which is incorporated into the base material in quantities of between 55 and 70% w/w, will begin to decompose. • Peroxide-crosslinking polyethylene (XLPE) for cable insulation; here the maximum permissible temperature during the compounding process is even lower – only 125 °C, as any higher temperature could trigger peroxide decomposition and crosslinking reactions. • Silane-crosslinkable cable compounds – the liquid silane is injected straight into the polmer melt by way of a special injector, primarily in applications where the compound is to be used for the insulation of low-tension cables and, in addition, has to be provided with flame-retardant properties, this now being a more frequent requirement. • Semiconductive polyolefin compounds for power cables containing up to 40% w/w conductive carbon black. These materials typically have very low apparent density and must be metered into the kneader with absolute precision and homogeneously mixed into the melt with optimum shear and without destroying its structural properties. A comprehensive range of accessories, e.g. 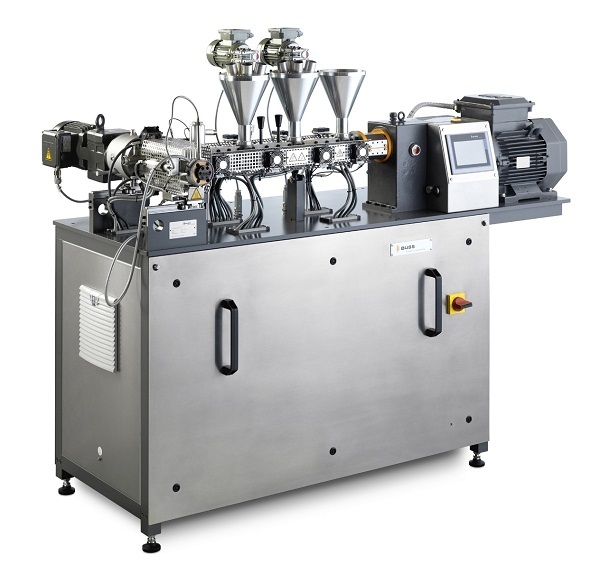 metering systems for raw materials and different pelletizers, make this laboratory BUSS kneader a versatile and fully equipped small-scale compounding line that can be used not only for product development trials but also for the production of sample quantities for customers’ own trials or for the small-batch production of a wide diversity of cable compounds.